Martin Luther King Jr. was in Georgia State Prison at Reidsville. His wife, Coretta Scott King, didn’t know that he had just been imprisoned. Coretta was pregnant with their third child at the time, so Dr. King decided to write her a letter. In his letter, he told his wife that he wasn’t sure how things were going to work out, but he had to believe that everything was going to be okay. He also included words of encouragement. Today I find myself a long way from you and the children. I am at the State Prison in Reidsville which is about 230 miles from Atlanta. They picked me up from the DeKalb jail about 4 o’clock this morning. I know this whole experience is very difficult for you to adjust to, especially in your condition of pregnancy, but as I said to you yesterday this is the cross that we must bear for the freedom of our people. So I urge you to be strong in faith, and this will in turn strengthen me. I can assure you that it is extremely difficult for me to think of being away from you and my Yoki and Marty for four months, but I am asking God hourly to give me the power of endurance. I have faith to believe that this excessive suffering that is now coming to our family will in some little way serve to make Atlanta a better city, Georgia a better state, and America a better country. Just how this can happen I do not know yet, but I have faith to believe it will. If I am correct, then our suffering is not in vain. What’s remarkable here is the positive mindset of Dr. King in his letter to Coretta Scott King during such a challenging time of adversity. The lesson that we can take away from this letter is that this same mindset can be applied in any challenging situation, circumstance or condition you might be facing. When dealing with adversity, you may not have any idea how it’s all going to work out, but what you CAN control is your own mind. You can choose to have faith that everything will work out. Many years ago, over the course of about a decade, I had the privilege to work on a project with the United Nations, Martin Luther King Jr.’s children and Mahatma Gandhi’s grandchildren. 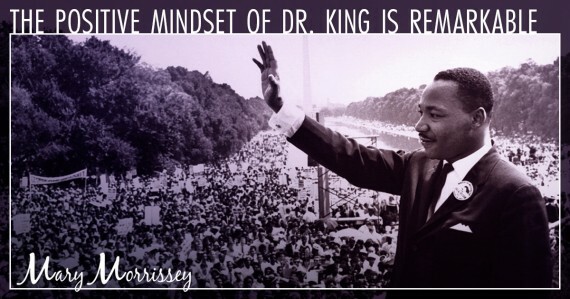 The project centered around the topic of nonviolence and operating with the mindset of both Dr. King and Gandhi. Both Dr. King and Gandhi believed that things were going to work out one way or another. They believed there was a power in themselves, and that there was a power in the universe that was greater than any adversity or difficulty they would ever face. The adversity that you’ve faced, or may be facing today, can seem overwhelming and even staggering at times. Yet you have the power to apply a mindset like that of Dr. King and Gandhi – the type of mindset that helped them lead the Civil Rights Movement and Indian Independence Movement. 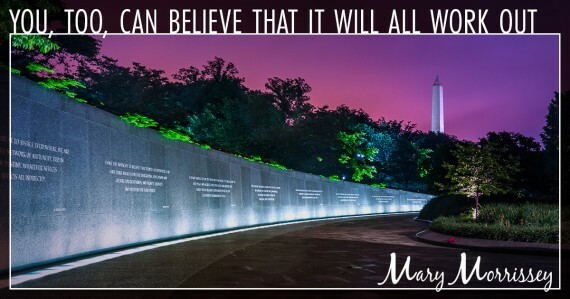 In his letter to Coretta Scott King, Dr. King said, “I have faith in that power.” He didn’t have to know exactly HOW the situation was going to work out, but because he believed he was doing the right thing, he believed that that power would work through him in ways that would bring about good, and he wanted to see this good for Atlanta, the country and for his family. Whenever you face any challenging situation, circumstance or condition, remember that there’s a power greater than you that’s breathing you, and that power knows more than you know. By working with this power, you can believe that everything will work out. Now here’s a question for you: In your own life, can you think of a time when a challenging circumstance, situation or condition came up for you and you chose to have faith that it was going to work out? And while you’re writing, think about the words of encouragement and faith you can give to others who might be going through a difficult time right now. I think it’s a very important day for us to share with one another, encourage each other, especially at this time in our country and our world. 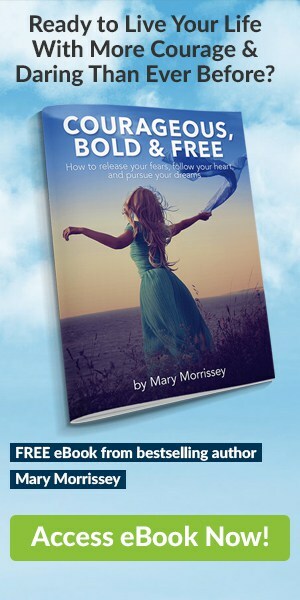 If you dream of enjoying increased health and vitality, closer and more loving relationships, a more fulfilling vocation, the ability to give back to causes that you feel passionate about, or greater time and money freedom, but you’re not sure how or you feel like you need more support…Then my ebook, “Courageous, Bold & Free,” is a must. Life has a purpose and only by knowing its purpose can make it beautiful and meaningful. There were many instances in my life that God shows his promise. And still I have a strong faith in God that he will keep his promise for me and my family in HIS time because God was, is and will always be the skipper of my life. It was 1981 and I was unsure of my future. I dropped out of college from my studies of being a veterinarian. I wasn’t good at science and I wanted to be a good vet. I ended up taking a chance and entering a program through my church called the Tithe of Life. In the church, a tithe is 10% so I was tithing my life (2 years as I was 21) as a youth director for a small brand new church. I was trained and worked in Texas even though I lived in Florida. It was a scary time but I was fortunate to have some career counseling while in Texas and came out deciding that I would be a teacher. So when my time was up, my friend and I moved to Austin, Tx to finish our education. I became a Special Ed Teacher and for 26 years lived a life full of purpose. I am now retired and taking care of my mom. I am very proud of my accomplishments as a teacher and those people that I met in Houston are still some of my best friends. I continued to live in Austin and now Kyle, Tx. My mom moved from Fla. to be with me. It’s been a long road but it seemed to have worked out just fine. Thanks Mary, for all you do. In my youth it seemed every thing I did, I was the best. I envisioned and held the picture in my mind of the tasks I would excel at and everything came true. Then life happened, being gullible and trusting of everyone, I found myself relieved of 20 years of savings by people I believed in, shook my world to the core and planted some deep core beliefs and paradigms of mistrust and doubt in my fellow humans and so I became reclusive. Over the last 1 1/2 years I’ve tried to shift that paradigm, invested over $10k in borrowed money in self improvement and have seen some incredible results, namely, contacting the person who was instrumental in the loss of $269k and forgiving him, not for his actions, but for his life to move on from the atrocities of his past so he was free to create good in his life and be a good example for his family. Now I find myself at age 61 and although living paycheck to paycheck, I know my life has meaning and purpose, maybe it’s just trying to help one person at a time in this world with no fanfare and in obscurity, lifting others out of the quagmire, or possibly pushing them out as it seems like I can’t break free myself. Even if finances fail, LOVE endures, GOD IS, I AM. And I’m no better than anyone else, therefore God loves us all in spite of ourselves, hold dear to your heart and find grace in all of your experiences, that Love. In 1997, at the age of 40 I was in a relationship trying to do the right thing to prevent pregnancy when I became pregnant. I was shocked as I didn’t think that I would become pregnant but I did. Shock quickly turned to joy and I talked to my partner about this. He told me that he was not ready to get married and I should terminate the pregnancy. It was a painful circumstance to deal with because I realized the implications for my baby who would grow up without a dad. I decided to go ahead with the pregnancy knowing that I would do this alone for many reasons and had a knowing deep inside me that it would be okay. One of my best friends at the time told me to hold my head high. I was confused why she would say this but with time grew to understand what she meant. Although I felt that I was making the right choice and giving my baby life, society is often unforgiving and judgemental of women who are single moms while men can walk away unrecognized for their part in the situation. I held my head high and never looked back. It is one of the best decisions I ever made. At 35 weeks, I went for a routine OB checkup when my doctor told me she would need to admit me to the hospital because it appeared that I had pre-eclampsia. I was admitted and my doctor began to induce labor with a pitocin and magnesium drip. I called my partner to let him know that I was being admitted to the hospital and asked if he could join me to see his baby born. He told me that he had an important meeting in England that week and could not be there. I was so incredibly disappointed because I knew how important this experience would be to his connection to this baby. I adjusted and continued with what I was facing. I was thankful that I had my mom and my meditation teacher with me for support during this time, a process that would take 2 days to complete. Half way through this induced labor process I became very ill and the pre-eclampia became severe and I developed HELLP syndrome for which I had very high blood pressure, low platelets and elevated liver function tests. The medical field does not understand the etiologies of these conditions in pregnancy even today and are doing much research on it. However, I could see that everyone around me was worried and working hard to help me. At one point I had 5 minutes of the most peaceful beautiful experience of my life. I have never had that sense of peace before; I have never had that depth of peace since but at the time I sensed that there were angels or spirits in the ceiling looking down at me in the Delivery Room helping me. I sensed that all of the people that I had helped in my life were now helping me and there was nothing to fear, I would be fine. I did have several critical unforseen periods during the next week but as I experienced, and as I sensed, I trusted this feeling deep within me and yes, I delivered my baby 18 hours later. She was beautiful and very healthy despite the fact that she was 4 pounds and 1 oz. It was THE BEST day of my life and I am grateful for this higher power, this Universal support that I had, that I felt and I trusted despite the circumstances. It was one of my greatest life lessons and I work everyday to help people, especially parents, develop an understanding of what they can do to maximize their health and prevent illness especially in regards to their children. It all started with a spiritual experience which led me to trust my inner wisdom and sensing a Higher Power/ Universal Spirit that is here to support us all when we trust in that Power! Thank you so much again Mary! It WILL all work out. My health, my money, my family….. is in transition time! This very message is for me. With faith one can really go far in life. But i need you to help me on something,i will love to be part of your organisation. Thanks Moses. Thank you for sending me this ebook for free. I pray to go a long way to help me, my family, the youth of my church and others. God richly bless you and your team. I like your discussion points. * Did you make the decision re: the photo on the book cover? Can we please represent that grey haired (55+) women and men, of every ethnic background, are also questioning their purpose, their faith, and looking for inspiration to have the courage to do their life’s work? Why does it look like the only group we are writing for are Caucasian, blonde, 20 to 30 years old, and female? This is a trend in ads for yoga offerings, and lots of personal development retreats, etc. 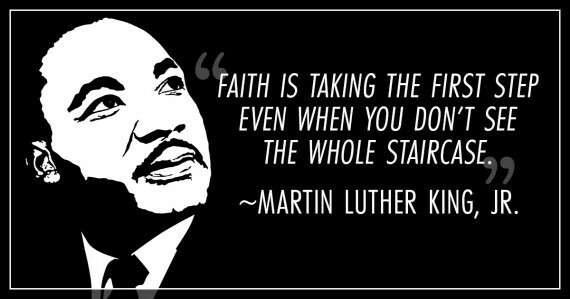 Thank you for posting words of encouragement and faith from Dr. Martin Luther King. He was truly a beautiful, courageous, and great human being. We are very much in need right now of uplifting words and actions that encourage us to be inspired and to have faith that sometimes “it is always darkest just before the dawn”. I, personally, believe and have faith in the power and intelligence of the ineffable Source/Life Energy that is within me and all around me. 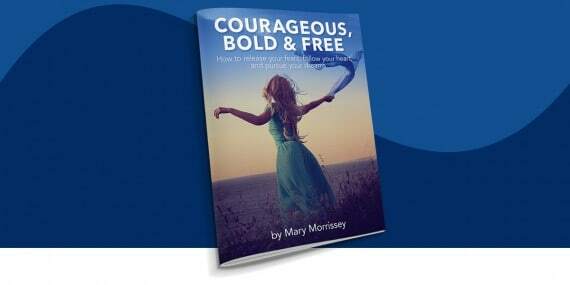 Thank you, too, for the free ebook “Courageous, Bold & Free”. My late husband and I developed a UK health resort, Champneys, from a bankrupt,run-down, old-fashioned establishment to a world-class spa over 16 years and through 5 different owning companies, the last one being a large international corporate group who, without any warning basically fired us, the only reason given being that we were not a fit with their future corporate plans. At the time I was devastated but within 3 weeks we formed our own spa consultancy company and created wonderful spas around the world for clients including award winning Chiva-Som in Thailand. When my darling husband passed away 10 years ago from cancer I felt half of me was torn away as I had worked, lived and played with this amazing guy almost 24/7 for 42 years and really did not know who I was as an individual. Now 10 years on, and at the age of 73, I know I have grown hugely in so many ways over these 10 years. I now work as a life-coach and am close to finishing a book which I am determined to get published this year. Since my husband departed I do something to challenge myself, take myself out of my comfort zone and raise money for the charities I support. These adventures have included an assault course in the tree tops called ‘Go Ape’, a Sky-Dive and I have walked the Camino de Santiago, a very challenging 500 mile / 800 km hike across northern Spain which I did completely on my own in my 70th year. I then became Education Chairman for YPO Gold London and last year I circumvented the globe in 80 days with my 22 year old granddaughter which included volunteer work in an orphanage in Nepal, staying in a hostel in Bangkok, cuddling koalas in Australia, nightclubbing in Bali and chilling in Hawaii. I love the slogan ‘The line of the horizon does not exist’…. we are confined only by the walls we build ourselves! One of my top 10 favourite quotes is that ‘As we go through life, we all experience pain, but misery is our choice’. Every day I miss my wonderful darling Allan, but I do not choose to be miserable, but instead to fully embrace life and be grateful for what I do have rather than to DWELL on what I do not have. I have also found it hugely liberating to differentiate between wants and needs. Apologies for going on so long, but I am passionate about the power of positive thinking. Just yesterday I had the privilege of addressing a group of school children with a presentation entitled ‘Attitude is All’, these were 10 to 13 year olds, and it was great to experience their enthusiastic engagement with the subject. Wishing all your followers the joy of life. My story occured around July 2018 when I was called for a job interview after being jobless for 2years,My wife at the verge of giving birth come September 2018, I did the interview to the best of my knowledge & received a congrutory email applauding me upon passing the interview & was told to forward 3 names/email id of my referees which I did, Little did I know the enemy was working behind the scenes to frustrate my efforts & the job was sold to some one who paid for it, Remember had been encouraging my wife that things would workout perfectly but though disappointed pulled myself together & one sunday went to church & shared all eventualities around my life, the struggles to pay rent,school fees for my daughter,food for home But I remember an agreement prayer being made about a supernatural provision will occur for the baby,food for home,rent & a better job(am still believing God for one) & as I write now are availed each day because I did cast all cares to God Almighty. My story occured around July 2018 when I called for a job interview after being jobless for 2years,My wife at the verge of giving birth come September 2018, I did the interview to the best of my knowledge & received a congrutory email applauding me upon passing the interview & was to forward 3 names/email id for my referees which I did, Little did I know the enemy was working behind the scenes to frustrate my efforts & the job was sold to some one who paid for it, Remember had been encouraging my wife that things would workout perfectly but though disappointed pulled myself together & one sunday went to church & shared all eventualities around my life, the struggles to pay rent,school fees for my daughter,food for home But I remember an agreement prayer being made about supernatural provision will occur for the baby,food for home,rent & a better job(am still believing God for one) are availed each day because I did cast all cares to God Almighty. Yes. The father of my oldest 2 girls had me erroneously incarcerated 10 years ago so that I would lose my teaching job which sustained me and also lose primary custody of my children. I had no prior offense and have not had any since. Well, it worked. I lost everything & it ruined my career and the children went to him and were emotionally very damaged. Also, their father, a Congressional employee, refused to them affection and medical treatments when needed and they suffered as children through no fault of their own – questioning why they were even born. He even went to their exclusive DC private school and threatened to sue them and the girls lost their full scholarships. Well, I never gave up. I did what ever I had to do to remain in their lives. I told them I loved them every time I saw them. My girls are dynamite. I used the time to expose them to as much as possible through the church and through camps and internships (sailing, horseback, VBS, swimming, NIH, Walter Reed). Then, one ran away from her dad’s house and came to me and told me that she hated him. “No, he is your father. Together, we will work it out. It’s so true that when faced with difficult and challenging times, it is easy to give up. My experience has been one of observation. In my worst experiences l would say to myself…. This is not forever, this will pass and l asked why l put myself through it…. And the thoughts that came in were… There has to be a reason for this, what’s the bigger picture, you(meaning God)must have something in store for me. I must say that l am happy that l always had that outside observing mindset and intuition. It didn’t stop me from going crazy at the time but deep inside l would smile and say ‘you kidding right’. I just knew that l was being prepared for something. And l turn out to be right. My experiences were to help me to help others. Just love the way it works. I always view life with childlike wonder. Never fails. this is exactly a moment in which I really very much needed to read all the above text. I just am trying to make myself having a strong faith and believe that things will indeed work out soon in a very good way, this way or the other one. I just believe they will indeed. This post of yours surprised me because I was not aware that you possessed a politically charged mind to lift up people who desire to rise up and conquer. I appreciate your thoughts and insights. I have already written to you and answered your questionnaire. Keep me in your mind and put me in contact with those who are of the mind and that I will thank you effusively. Dear Mary, thank you for sharing this precious video with us– especially in Martin Luther King Jr Day! In Brazil we are going through huge political challenges, and I am feeling quite overwhelmed… By watching your video I plugged into the higher vibrational energy which recharge my mind with words of wisdom peace and hope that everything will bring about good for everyone concerned. Just lost my husband seven ago and has been difficult for me. Thank you, Mary, for an inspiring message! It is always a pleasure listening to your stories and messages! No words at this time. On 17/3/2017 my 12y old son was diagnosed with inoperable brain tumour. I new when I heard this horrendous news that we had been sent this journey for a reason and that it was going to be a tough one. I encouraged my son and family to be strong, have faith and know we woujd come through this. It took the Medical team 2mths before they were able to get a diagnosis on the brain tumour due to its difficult access they struggled to get good tissue samples. But eventually he was diagnosed with a malignant Germanoma Brain Tumour. He start Chemotherapy for 5mths then 3 mths of Radiotherapy. My son had to miss most of his school year. But he continued to do his own studies at home. Most days he would get out for short runs or a shot some hoops. He even ran in his school cross country which he was determined to finish. While having Radiotherapy we had to stay up at a home close to hospital. He would have his 10min treatment on Radiotherapy then he would head to the hospital school. Come home in his lunch time. Go out for short run in his lunch break before heading back to school. The strength that was given to my son through all his treatments was incredible. He had his bad days where he struggled to eat and get out of bed. We prayed and encouraged him to rest. I would talk with him and say, we will get through this and you are going to be so strong for it. One day you will beable to use this strength to help others. Just rest today and let it be. This time last year I was addicted to cocaine and cannabis. Everyday I would say, “this isn’t my life, It’s going to be okay” I knew I was being looked after and I was building my strength to fight for myself. I quit cocaine in June 2018, cannabis in October 2018, and now in January 2019 I’ve also quit cigarettes. Taking a chance story that ended well. When I was 8 yrs old a girlfriend in my 3rd-grade class showed up at my house with two very popular boys. I was glad to see them but felt anxiety as well. Since I was outside when they arrived, I excused myself for a minute to go inside and collect myself before meeting with them again. My sweet rescued puppy from the alley behind my house stepped out on the front porch as I came in. And thinking he would be fine with these “nice” kids for a minute or two, I was not concerned. It was only when I came out again and realized these boys were terrorizing my puppy by throwing pocket knives at him wherever he stepped, causing him to shake with fear and become paralyzed that I was sorry for my decision. At that moment, I seemed to go into a trance-like rage with a voice and thoughts seeming to come from beyond me. I do remember saying something about God and how this was his divine creature and how dare they threaten his life, etc. Then I told them to leave immediately. Thank you Mary. This is a very encouraging message for all of us to hold in our hearts. Hi,I am Sheila, I am facing with a very challenging circumstance in my life, I have two precious man in my life both of them has some kind of attachment.I love both of them. And they both wanted to be with for the rest of my life. But I need to choose only one but I don’t know who I am gonna choose which is both of them is so kind, and very generous. I am very confused. I know if I decided to choose one, one of them will got hurt. I am praying and asking God’s guidance to guide me of who I am to choose. please pray for me. Am so confused. These were great words of wisdom but at the same time skills to have to gain strength in adversity. Thank you, Mary….you inspire me as well…you are doing wonderful work! My husband dies a painful death through cancer of the liver leaving me with 4 children all in expensive schools but I believed that God was going to provide all the needs “through “me and sure enough everything worked out through 3 avenues : farming, workplace and credit union. As I was about to enjoy the fruits of my labor, adversity strives again, 3rd child dies on the spot in a road accident. He had qualified with flying colors and got employed as a pilot. Initially, I just didn’t see myself surviving the tragedy; I believed again that , for the sake of my 3 surviving children who were traumatized beyond description, I was going to stay strong and I am here writing this. The pain comes and goes but I am determined to endure till the end. Whoever is going through difficult times, I want to say, the “morning “ will come. Stay strong. Mary Iam facing a very challenging situation in my life right now. Facing redundancy in a foreign land with three children and have to pay up some loans. This is what I believe too.. life has got my back and everything is going to be fine. Iam being given a signal that I have to do some work to reach my supreme desitny.. it is the time to do what I have postponed doing for so long so that Iam going to experience my best life ever … larger and stronger than this circumstance . Thank you and love you so much for teaching me these concepts.